Blurb: This step-by-step guide teaches you everything you need to know to experience amazing physical psychic abilities like telekinesis, materialization, teleportation, extreme healing and many more. This is not theory. Learn from someone who actually did it. 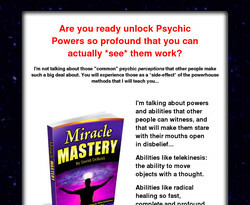 "Miracle Mastery" teaches you exactly how to unlock the true mysteries of the human potential. Amazing psychic and spiritual abilities. It will give you specific, step-by-step instructions for all of the psychic abilities. It'll teach you how to focus your thoughts and efforts to create real, physical, "Miraculous" changes to help yourself and others. It's all about the science of your mind, the science of your spirit, and the "spiritual technology" that is the result of the practical applications that come from uniting the two into a force that can literally change the world around you. "Miracle Mastery" assumes you are starting from the beginning, and teaches you everything you need to optimize your body, mind and spirit, and then how to integrate them so that the whole is much greater than the sum of those parts. It'll even teach you the rarest, most powerful psychic skill of all time: how to use your personal, "internal" energy as a catalyst to summon vast amounts of additional energy from your environment to use as you see fit. -Manipulation Class: The ability to freely convert matter to its component energy, manipulate that energy and then reassemble it into matter of a different configuration or at a different location.